Armstrong Whitworth Co. of Newcastle upon Tyne did a lot of experimentation with various forms of locomotives, including the unsuccessful steam-turbine-electric locomotive designed by Mr. D M Ramsay and delivered to the Lancashire and Yorkshire Railway in 1922. In 1933 they released for trials on the LNER a 1-Co-1 diesel electric locomotive. 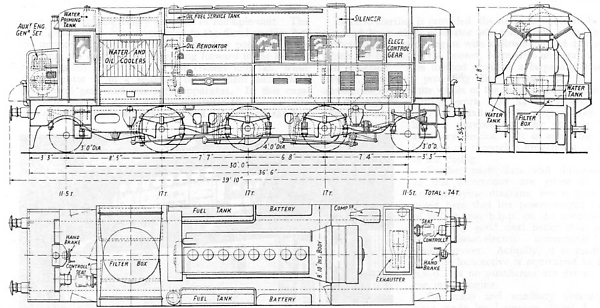 This locomotive had been designed as a mixed traffic machine, with a maximum axle loading of 17 tons, a maximum starting tractive effort of 28,500lb and a maximum speed of 70mph. It was also fitted with multiple working capabilities to enable two locomotives to be worked by one driver on goods trains up to 1,500 tons and 500 ton passenger trains up to 60mph on level track. The one loco built was permitted to haul 800 ton freights or 260 ton passenger trains. The 1-Co-1 wheel arrangement utilized four foot diameter driving wheels with Iso-thermos axle boxes with an equalised spring arrangement allowing usage over indifferent track. Sanding was provided on the two outside driving wheels with air supplied from a small compressor. Braking was by means of the automatic vacuum system, two large cylinders applied brake blocks to all the driving wheels. The diesel engine used was an Armstrong-Sulzer 8LD28 eight cylinder inline device with a cast cylinder block comprised of two four cylinder units carried on a steel welded crankcase. Attached to this was the main generator frame, and the whole diesel-generator set was supported directly by the locomotive frame. The cylinder heads are separate, housing the inlet & exhaust valves in cages for easy maintenance of the valve seats. The cylinder liners are of cast iron, of the wet type, with the pistons of forged aluminium. The rated output was 800hp at 700rpm with a brake m.e.p. of 80lb per square inch. All output of the engine was available for traction, an 80hp Armstrong-Saurer engine housed in the nose supplied all the auxiliary needs and obviated the need for a large and heavy set of batteries to start the main engine. Rather unusually the main engine carried no metal rocker covers, roll-back leather covers were used, held in place by spring fasteners. Two large side mounted radiators provided cooling for the water and lubricating oil, air being drawn through by a roof mounted fan. The fuel tanks and 24 cell batteries were mounted either side of the engine alongside the walls. Because of the fitting of the auxiliary engine descriptions of the locomotive give its horsepower as either 800 or 880. The electric transmission was controlled by a regulator operated by a hydraulic servo motor permitting full output of the diesel engine from 6mph to 65mph. Although the Laurence, Scott & Co Ltd main generator was directly coupled to the engine the bodywork was built up between the two so as to place the generator in a separate enclosed space. This compartment also contained the control gear, compressor & exhauster. The three Crompton Parkinson Ltd self-ventilated axle-hung traction motors had roller bearings for the armatures and white metal lined pad lubricated suspension bearings on the axle. The control gear was supplied jointly by Laurence, Scott & Co and Crompton Parkinson. The locomotive entered service on the LNER on July 6th 1933, working between Newcastle & Alnmouth, additionally making several trips between Newcastle and Hexham. Further tests in 1933 were to be completed with goods trains of forty five & sixty wagons between Newcastle and Berwick & York. The machine remained a speculative venture for its owners, and the LNER were not particularly interested, a fact not helped by a crankcase explosion during June 1934, which led to its retirement. The Armstrong Whitworth 1-Co-1 was withdrawn after the crankcase explosion of June 1934, and is believed to have been scrapped. I am not aware of any models of the Armstrong-Whitworth 1-Co-1 in any scale. Photographs and technical specifications, courtesy of Armstrong Whitworth / Diesel Railway Traction / IAL.